CLEARS WATER, BOOSTS ITS QUALITY AND ADDS OXYGEN: When assembled and installed, the EasyPro LA10N Economy Linear Aeration Kit raises the oxygen level in pond that is up to 6 feet deep and has 3000 to 8000 gallons of water. The increase in oxygen improves the water's quality and clarity. This aerator unit has a maximum recommended operating depth of 6 feet. BENEFITS FISH AND PLANTS: Because this aeration system improves a pond's water conditions, it helps koi, other fish, aquatic plants and good bacteria thrive in the environment. Also, its circulation of water leads to more uniform temperatures in the pond. The better conditions promote fish health and help protect fish during freezing weather. 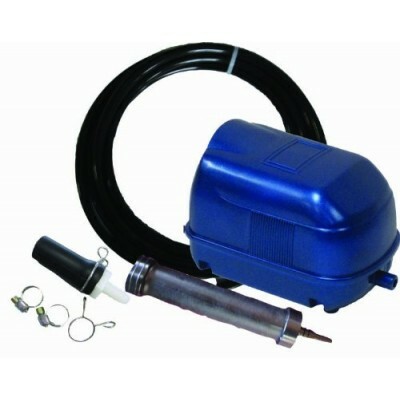 IDEAL FOR A SHALLOW POND: This kit's continuous duty pump is perfect for aeration of a smaller, shallower pond. It operates to a maximum depth of 6 feet, and its motor pumps up to 1.8 cfm of air. Energy efficient, the system uses only 34 watts of electricity and runs on 115 volts. This kit includes an air compressor that has a 2 year warranty, 15 feet of Quick Sink weighted tubing with a 5 year warranty, an 8 inch long rubber air diffuser, which has a 5 year warranty, and clamps. IMPROVE YOUR POND WATER with the EasyPro LA10N Economy Linear Aeration Kit. Click "Add to Cart" now. PERFECT FOR A SMALL, SHALLOW POND: The EasyPro LA10N Economy Linear Aeration Kit is ideal for aerating a pond up to 6 feet deep and containing 3,000 to 8,000 gallons of water. Installing the kit takes only minutes. It includes a quiet, linear diaphragm EPW4 air compressor, which is weather resistant and has a 2 year warranty. IMPROVES WATER CONDITIONS AND HELPS AQUATIC LIFE: This effective aerator raises pond water's oxygen level, clarity and quality. The improved conditions help the pond's koi, other fish, aquatic plants and beneficial bacteria. CONTINUOUS DUTY PUMP RATED TO RUN 24/7: The kit's energy efficient pump motor can be on all the time and uses only 34 watts of electricity. It operates on 115 volts of electricity and plugs into a 120 volt AC GFCI protected outlet. This small aerator's maximum air flow is 1.8 cfm. INCLUDES A DIFFUSER, WEIGHTED TUBING AND MORE: This kit provides an 8 inch long rubber air diffuser, which has a 5 year warranty. It also comes with 15 feet of Quick Sink weighted tubing that has a 5 year warranty and promotes easy installation. Clamps are included, too. AERATES POND WATER ALL YEAR: Because this aerator unit has a weather resistant compressor, you can use it outdoors throughout the year. The system is designed to increase oxygen levels during hot summer months and to maintain open water during winter months in a freezing climate.